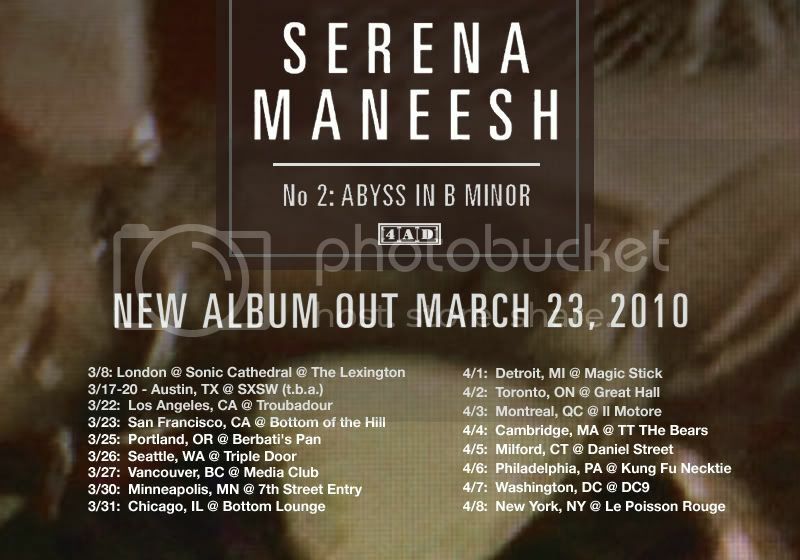 Oslo-Norway indie/alternative act, SERENA MANEESH are going on a short tour to support their March 23rd release of their second full-length, S-M 2: Abyuss in B Minor. They will also be playing multiple SXSW dates hosted by BrooklynVegan, Filter, Purevolume, Pitchfork and more. 4AD is giving away a 12″ single for Ayisha Abyss. email paradeof@paradeofflesh.com with Serena in the subject. Email within the next day or so… winner chosen at random. This entry was posted on March 3, 2010 at 10:20 pm, filed under News.